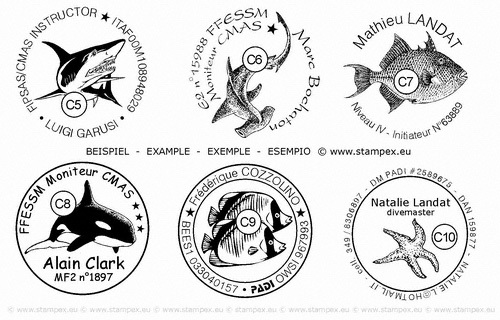 We offer you hundreds of designs specifically for dive stamps. 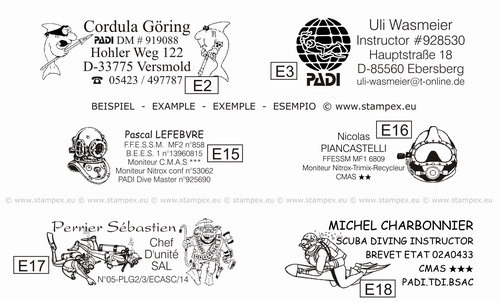 Below are some examples of how we design the stamp to your specifications. Of course, you can upload your own logos or graphics during the ordering process. We will send you a free stamp-layout proof of all stamps you ordered. We will also change the layout until you really like it. This is 100% satisfaction by STAMPEX. We will add the examples of other sizes soon.